I worked with a Korean interpreter a few years ago and I asked her where she thought the best Korean restaurant in Boston was and she raved about Chung Ki Wa in Medford Sq. I finally got to try it out with Brian and Noam. The restaurant is quite large and there were only a handful of other tables for lunch. 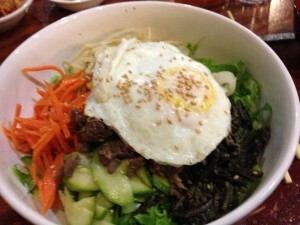 I had the bibim bap, a dish of rice topped with vegetables, sliced meat and a sunny side up egg. It’s normally served in a hot stone pot so the rice on the bottom would sear and develop a crunchy brown crust, but mine was in a cold ceramic bowl. I was quite disappointed. I thought Brian’s bulgogi was only okay, as well. Our lunch specials came with miso soup and were $8, which is not unreasonable. The server was friendly and quite taken with adorable little Noam.